"Mentor Plus, an organization that teaches accountants in public practice how to deliver the kinds of proactive services their clients crave, today announced the launch of their Online Level 5 Certified Advisor (L5CA) Training. After more than 20 years of live training, CEO Edi Osborne has captured all of her wisdom in an easily accessible online format. The more than 100 resources include recorded videos, downloadable tools, and hands on tutorials forming a single repeatable protocol for accountants looking to build or expand a consulting practice. The L5CA online training covers the three elements: Mindset, Skillset and Toolset that are vital to the success of Certified Public Accountants (CPAs) looking to deliver specialized services. Throughout the training, students learn to ask different questions that uncover opportunities for helping their clients in all aspects of their business from: Level 1 – getting the basics right, to Level 2 – speaking the language of business, to Level 3 – mapping a plan from current results to desired outcomes, to Level 4 – associating measures with activities, to Level 5 – continuous improvement. 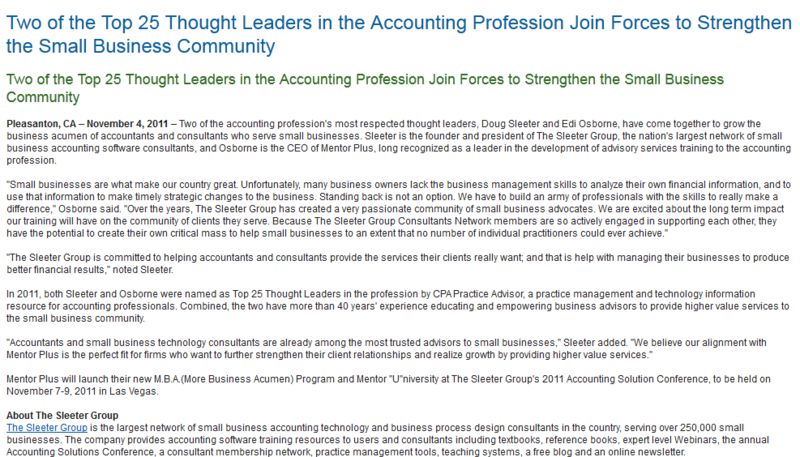 The training is designed to give accountants the confidence they need to leverage their existing skills in new ways." "Mentor Plus, a Carmel Valley, California-based organization that teaches public accountants to deliver proactive services, has launched its Online Level 5 Certified Advisor (L5CA) training. The online course collects CEO Edi Osborne’s 20 years of live training material and instruction in one place. L5CA consists of more than 100 resources, including recorded videos, downloadable tools and hands-on tutorials, forming a single repeatable protocol for accountants looking to build or expand a consulting practice. The online training course covers three elements that Mentor Plus builds its philosophy around: mindset, skillset and toolset. Throughout the training, students are taught to ask different questions to uncover opportunities for helping their clients in all aspects of their business." Get the full story . . .